The Corini Farm is widely considered one of the top dairy farms in the region. Their management silage production and results are respected amongst local producers. So when they decided to start crossbreeding in 2007 people noticed! As in many herds reproduction was a problem at Corini’s. However their extremely high milk production and extremely challenging climatic conditions (+38 degrees Celsius in summer) added special challenges. While their results were considered very good for the area: they believed they had to look at alternative solutions to the high inputs necessary to achieve these results. Stefano Corini says the best cow in his herd is a Norwegian Red x Holstein. Currently in her 4th lactation she has averaged 38.40 kgs of milk 4.23% fat, 3.20% protein per day in milk through her life. Stefano is breeding the strongest NR x Holsteins back to NR to lock in the high fertility and health performance. The less strong are getting bred to Fleckvieh. 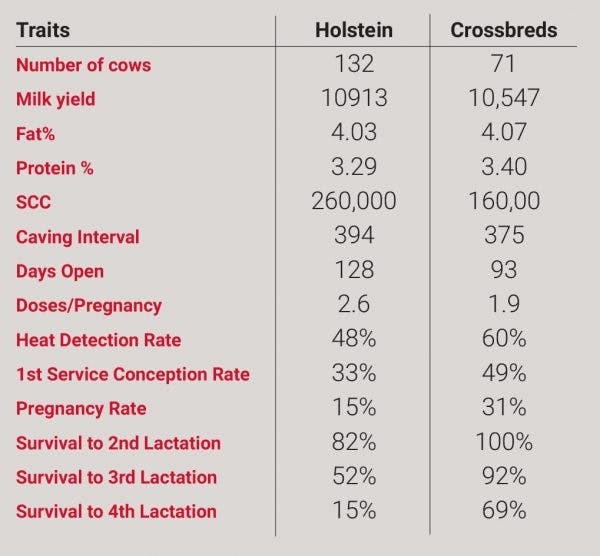 This example mirrors the steady production and superior health and fertility performance that has been reported in trial after trial around the world, proving Norwegian Red crossbreds excel in high output situations.